Although your wedding is meant to be one of the happiest days of your life, it can also bear a touch of sadness if you’re celebrating it without a cherished loved one by your side. It may be difficult to find the right balance between acknowledging your lost loved one and fostering an air of celebration on your big day. While you’ll never be able to replace your late loved one, there are many heartfelt ways to incorporate their memory and spirit into your celebration. 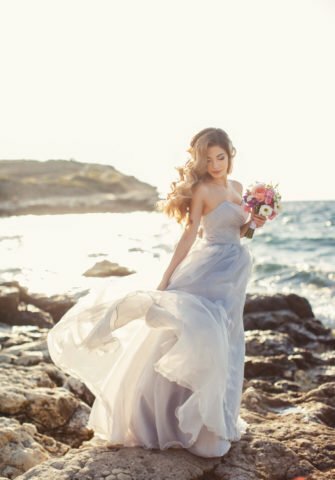 Whether you’re saying “I do” on the beach or in the church you grew up attending, there are many opportunities to honor a lost loved one at your wedding ceremony. A subtle yet meaningful way to pay tribute to those who have passed away is to reserve a seat for them at your wedding ceremony. Consider making the gesture more visual by adding a framed photo or personal items, such as your grandfather’s cherished baseball hat or your mother’s pearl necklace to the seat. Lastly, tie it all together by adding a simple flower such as a lily, rose, or carnation — all of which are commonly used to pay tribute to the deceased. When you peer out into the crowd as you’re about to say your vows, the seat will help you remember and feel connected to your late loved one at that moment. Many couples provide their guests with a wedding program that details the day’s events. This program is an ideal spot for you to add a note acknowledging loved ones who aren’t able to celebrate with you. Use your wedding program text to list your lost loved one’s name(s) and explain the ways you’ve chosen to honor them throughout the wedding. You may even opt to include a photo or written text further describing the missing guests and their relationship to you and your partner. If you’re saying “I do” outdoors, consider hanging a set of memorial wind chimes at the venue. Each time the wind blows, you’ll hear the soft chime and be instantly reminded of your lost loved one. This subtle yet sentimental sound will be a source of comfort as you stand in front of your friends and family and exchange nuptials. You’ve said “I do” and now you’re ready to start the celebration! Your wedding reception is a meant to be a joyous event, and therefore you may be unsure of how to pay tribute to a lost loved one at the celebration. However, Instead of ignoring their memory for the rest of the evening, find a tribute that feels right to you. Consider one of the following heartfelt displays to naturally incorporate the memory of a departed loved one into your celebration. Don’t be afraid to talk about your lost loved one during your wedding reception. While you might fear that discussing them will bring an air of sadness to your big day, it’ll be a cathartic experience that will be appreciated by guests. Use your speech as an opportunity to share special memories, funny stories, or words of advice given to you by the deceased. You’ll find that writing the perfect wedding toast is simple when it comes from the heart. If you have multiple lost loved ones to honor, you may want to feature a thoughtfully decorated memorial table at your wedding ceremony. Choose a quiet location, removed from the celebration, for guests to privately pay homage to the deceased. Include a mixture of photos and sentimental items that will help visitors connect with the departed’s memory. Consider sprinkling the table with petals from your lost loved one’s favorite flowers as well as lighting candles in their honor. For example, a display of your father’s treasured pocket watch, a smiling photo of your partner’s beloved grandmother, and petals from your aunt’s favorite flowers will make for the perfect wedding memorial piece. While a father-daughter and mother-son dance are a featured tradition at many weddings, they aren’t always possible. If your father or mother is no longer there to participate, consider hosting a special dance in their honor. For example, if you’re unable to dance with your father, ask another family member, such as your brother, uncle, or cousin to share the special dance with you. You can even choose your dad’s favorite song by the Beatles and make a heartfelt announcement to your guests before starting the dance. If you need some inspiration, a well-known wedding song may be the perfect choice to complement this special moment. Perhaps you want your loved one’s presence with you from the time you walk down the aisle until the moment you drive away as newlyweds. The following unique wedding memorial ideas will allow you to incorporate your loved one’s memory into your entire day. Your wedding dress might be your something new, but that doesn’t mean it can’t feature a subtle tribute to your late loved one. Consider incorporating an element of your lost loved one’s clothing into your wedding dress. You can easily have a piece of your mother’s wedding dress added to your own dress — ensuring she is by your side as you walk down the aisle. If you’re worried about it clashing with the modern style of your dress, you can more subtly incorporate the desired piece of fabric by having it sewn into the lining of your dress. Your personalized wedding bouquet is meant to be a reflection of your unique style and interests, but it can also function as an opportunity to include a memory of a lost loved one. Consider wrapping lace from your grandmother’s Sunday’s best dress around the base of the bouquet. The added touch of your father’s cufflinks or your mother’s favorite earrings can provide comfort and solace as you walk down the aisle. However you choose to incorporate your loved one’s memories, don’t forget to remove the ornaments before you toss your bouquet into a hungry crowd of bridesmaids. Use items that remember the deceased to help you tick off elements of the timeless tradition of including “something old, something new, something borrowed, and something blue” in your wedding. Wearing jewelry that belonged to a lost loved one is an excellent way to add a meaningful, vintage touch to your look. Whether it’s your grandmother’s bracelet or your late aunt’s earrings, the borrowed jewelry will allow you to tastefully incorporate their memory into your bridal look. There is no one-size-fits-all guide on how to honor loved ones who have passed at your wedding. You and your partner need to decide on the wedding memorial idea that is right for you and your celebration. Use your loved one’s personality and interests as inspiration as you create a thoughtful wedding remembrance that both you and guests will appreciate. We’re sorry about the loss you’ve suffered and hope this article has helped you find a way to honor your departed loved one on your special day. Don’t forget to follow us on Instagram and Facebook for all your wedding day inspiration!